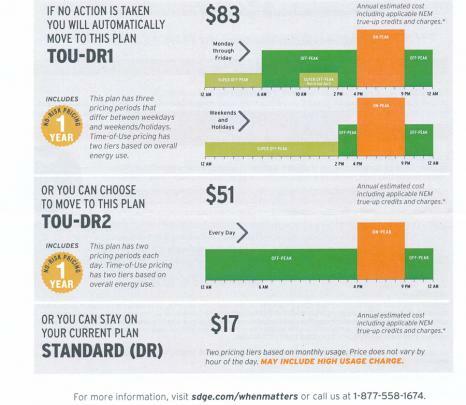 SDG&E's deadline to choose whether to use a time-of-use (TOU) plan or stay on the daily rate (DR) plan is approaching. Has anyone had experience whether time-of-use actually saved them a few dollars per month? The use case is a small condo, no dishwasher, no laundry, just an electric stove, heat, A/C, and usual lights and appliances. Electric bill is normally $40 to $70 per month. Submitted by treehugger on April 1, 2019 - 1:14pm. I have not decided, but is my understanding this is an experiment and if it costs more on average than your previous year SDGE will refund the difference at the end of the year. Submitted by svelte on April 1, 2019 - 5:51pm. I just received a letter from SDGE stating they will move me to TOU-DR1 if I take no action. But the attachment they included shows it will be the option that costs me the MOST!!! Thanks SDGE! Looking out for my interests, I see. Watch for the letter from SDGE and ensure you send them back a response picking the option that works best for your situation. Submitted by henrysd on April 1, 2019 - 9:16pm. I guess it is SDGE's calculated plot to switch to time-of-use to underpay home owners with solar panels for sun shine hours, so they can generate more profits. Solar panels get very popular last a few years, so capitalists invent a scheme to charge high rate at hours you are not generating power. Submitted by gzz on April 3, 2019 - 9:38am. My house and office I have had time of use for years. There are no dramatic differences. Last summer it was hot in the office and the AC wasn’t turning on, but at random. Turned out it was a smart thermostat turning off on super peak hours. They never asked me to consent to this either. Wasted an hour of my time figuring out the problem.